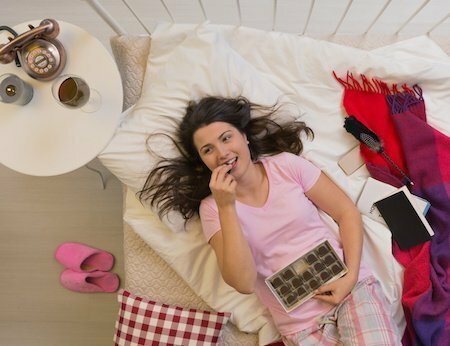 Valentine’s Day can be an especially difficult holiday for those who are single or have recently endured a break-up, however, it doesn’t have to be. The single most important person in your life to care for, offer time to, spoil and dote on is YOU! This year focus on your relationship with yourself and embrace singleness. When we look to others to instill our sense of value, worth, and place in the world we are indirectly dismissing the importance of acknowledging that we are whole, worthy, vibrant and connected individuals, whether we have a partner or not. Valentine’s Day offers those who are without a romantic relationship the chance to honor and celebrate themselves in the same way we might be inclined to do for our honey. Write yourself a love letter highlighting all of the wonderful parts of who you are. Take yourself on a date. Get dressed up or stay in pj’s with take-out and a movie, whatever offers you a sense of pampering! Engage with friends. Host a gathering with those who are also solo, whether at your place or out on the town! Make plans in advance. If you know this is going to be a tough day, don’t wait until the last minute to decide how you want to spend your time. Whether alone or with friends, make a plan that you can get excited about! Honor your feelings. Ignoring feelings of sadness, loneliness’ or anger doesn’t make these feelings go away. It’s ok to acknowledge what you’re feeling, validate yourself wherever you may be in this process and remind yourself to be compassionate, graceful and kind to YOU in the same way you would be with a friend or loved one. This Valentine’s Day, don’t misjudge your singleness for loneliness. Instead, celebrate your independence, honor your greatness, and treat yourself to something extra special because you deserve it. One of the missions of the Jessica Yaffa LLC organization is to help all women see their worth and what they do, and do not, deserve in relationships. If you feel individual relationship coaching could help you develop your views of intimate relationships, please reach out to us. We are here to help!